You have the option to stream directly to your Facebook Profiles and Pages of which you are an admin. This article covers going live to Facebook via Livestream Studio. If you are trying to stream to Facebook via the Livestream Platform Simulcast feature, see here. Navigate to the Stream tab in the lower right corner of Studio, then select Facebook. Click Sign in to Facebook. A browser window will open. 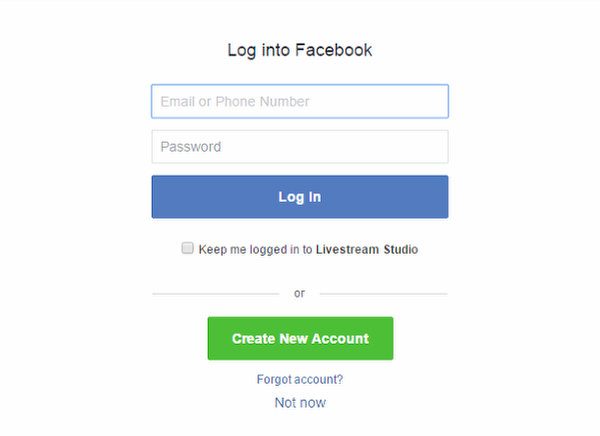 Enter your Facebook credentials, and select whether you wish to stay persistently logged into Livestream Studio. Then click Log In. 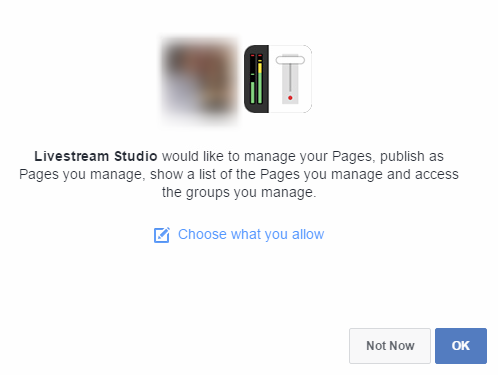 Livestream Studio will request several permissions, including your friend lists, events, ability to post, and access to pages you manage. Be sure to allow these and continue. We recommend setting your default audience settings to Public, especially if you ever intend to stream to an audience beyond your friends list. You can restrict your audience for each broadcast within Livestream Studio before you go live. Click OK to finish permission settings. When authorization is complete, you can close your browser window if it does not close automatically. Across the top of the Stream module are a handful of add-ons for your stream, including the abilities to tag your (1) location and (2) friends. 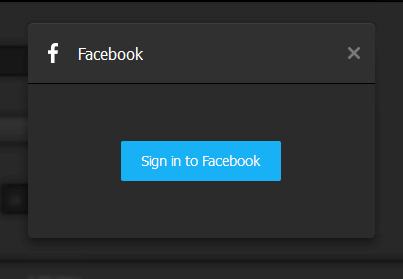 You can also log out of your Facebook account, click the URL to open the page where your stream will be hosted, or remove Facebook as a streaming destination. You can also access these options by hovering your cursor over the Facebook icon at the bottom of the module. Below these options are basic stream configuration settings. In the Post As dropdown, you can choose between your personal profile, any pages you admin, or any groups you admin. 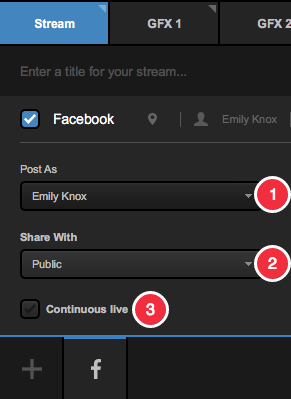 Share with lets you choose which audience you would like to share your stream with. 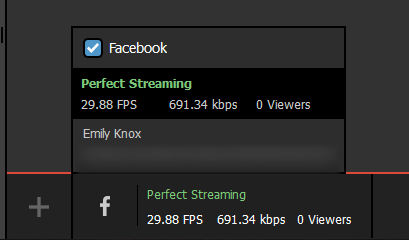 Check Continuous Live if you wish to keep streaming beyond Facebook's eight-hour streaming limit (note that this will not send out additional notifications or save any VOD from your stream onto Facebook). 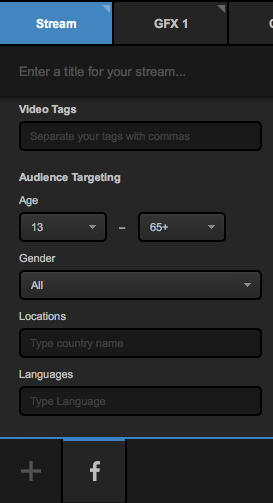 Below these basic configurations, click Advanced Settings to set a variety of options for customizing your live video post on Facebook, such as adding tags for other pages on Facebook, and audience targeting tools. You can also provide other metadata for your stream, such as targeted countries and what language the broadcast will be in. At the bottom of this section, you can select which network to stream over, if you have multiple available. At the top of the module, give your stream a name and select a streaming quality. For optimum performance on Facebook, select a single bitrate (e.g. 720p+) rather than a multi-bitrate quality (e.g. 720p + 540p + 240p). Clicking the gearwheel allows you to select your preferred aspect ratio. Choosing 1:1 or 9:16 will display a yellow Safe Area Display in Program and Preview demonstrating what your stream's output will look like so you can set your shots accordingly. You also have the option to see the display is all multiview sources, or to turn it off entirely. Here, you can also choose your default streaming network. Unless you specified a different network in the Advanced Settings section, your stream will broadcast over this network. Click Go Live to start your stream. Once you are live, you can view your stream by hovering the mouse over the Facebook logo and clicking the URL in the menu that pops up. 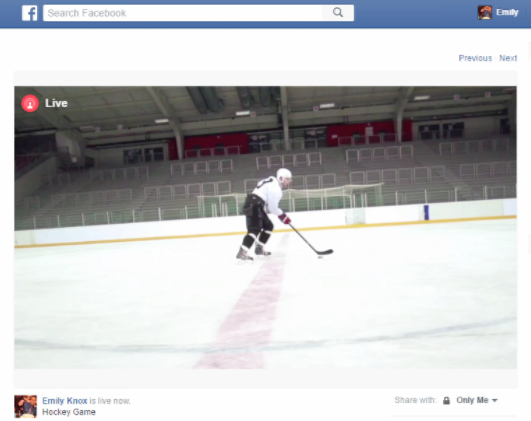 The stream will appear in your Facebook timeline after about 10 seconds. When you want to end your stream, click the red Streaming button. The broadcast will end promptly and the stream will save on your Facebook timeline for on-demand playback.